“Neither [Ben] Whishaw nor [Renee] Fleming portrays the title character in this equally hypnotic and exasperating production. Or not exactly. When first seen, on a snowy New Year’s Eve in the early 1960s, their characters appear to be a rather anxious businessman (Mr. Whishaw) and the thoroughly professional stenographer (Ms. Fleming) he has recruited to help him work, after hours, on a special project. That would be the very script of the show we’re watching, which is indeed about Norma Jeane Baker. If you don’t know that Norma Jeane was Monroe’s birth name, I wish you much luck in following this show. Because that’s only the first — and by far the simplest — of the identities attached to Monroe in Ms. Carson’s investigation of the illusion and substance of feminine beauty in a testosterone-fueled world of war. Helen is Norma Jeane, while her ostensibly cuckolded husband, Menelaus is transformed into Arthur, King of Sparta and New York (referring to Monroe’s third husband, the playwright Arthur Miller). Now why, you may well ask, is this a tale to be told by a man? Ms. Carson has said that she wrote this monologue with Mr. Whishaw in mind … His ability to cross the gender divide without coyness or caricature turns out to be an invaluable asset in Norma Jeane. Mr. Whishaw and Ms. Fleming are, against the odds, marvelous. They somehow lend an emotional spontaneity to ritualistic words and gestures, while conjuring an affecting relationship … As might be expected, Ms. Fleming brings a luxuriant, caressing tone to the song fragments … And though it’s a man who narrates — and tries to make sense of — Norma Jeane’s story, it is fittingly a woman’s voice that supplies the aural oxygen in which it unfolds. 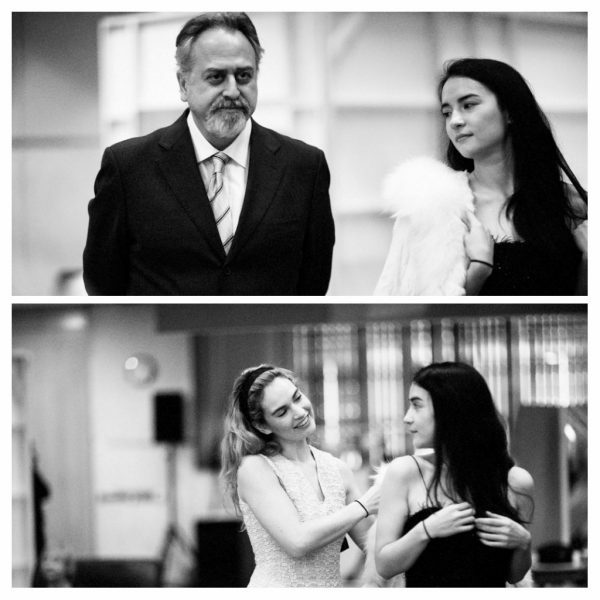 “It is a play formed, we learn in the program, through Euripedes’ Helen, which recast the story of ‘legendarily the harlot of Troy and destroyer of two civilizations’ from her point of view, and her sorrow. In the program, #MeToo and that exhaustingly overused phrase ‘fake news’ are both invoked, as well as Carson’s intention to ‘let dark realities materialize dimly’ in particular sections of the play. Well, Norma Jeane Baker of Troy can claim success on that score at least. The set, far too far away from the audience, feels like a retreating photograph. On it, you had two otherwise-wonderful performers, Whishaw and Fleming, playing within what first looks like the office of a gumshoe. It’s New Year’s Eve, turning to New Year’s Day, 1963, with fireworks booming outside like bombs. 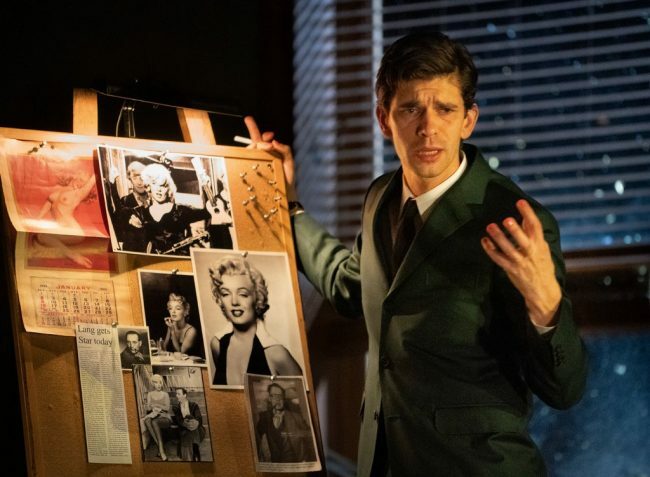 Whishaw’s character has a mood board of sorts, and—it turns out—is not a detective, but a screenwriter working on a film project that is a meditation on both Marilyn Monroe (who died the previous year) and Helen of Troy. The script drifts, utterly unmoored, between the two, their lives, ambitions, beliefs, and the men, dramas, and in Helen’s case war. Misogyny, ambition, and marriage pulse as themes. 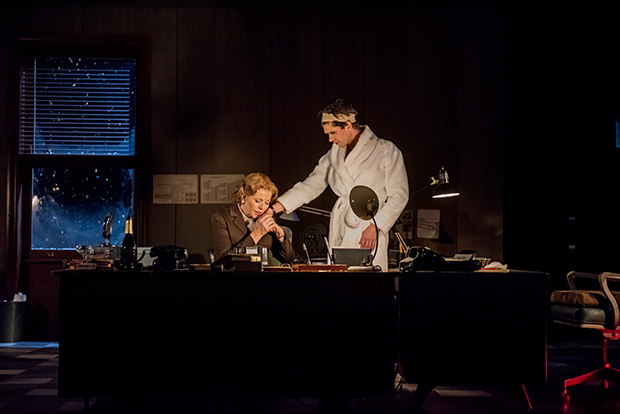 “Ben Whishaw plays Marilyn/Norma Jeane, or rather he plays a young man in suit and tie (costumes by Sussie Juhlin-Wallen) who dictates a modern update of the Euripides play to a stenographer (Renee Fleming) on New Year’s Eve, 1963. 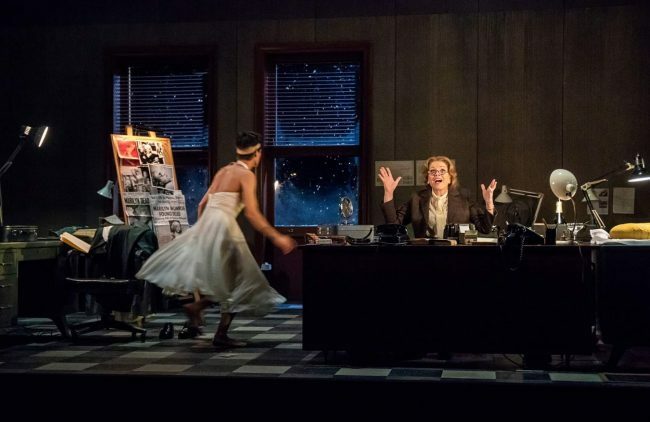 The two of them sit at desks in a very film noir office (set by Alex Eales, the minimal lighting by Anthony Doran) before Whishaw begins to dress up like Marilyn Monroe in The Seven Year Itch, complete with her signature white halter-top dress and ukulele. Ukulele? Maybe Whishaw’s drag persona borrows it from Sugar in Some Like It Hot, but then, inconsistency is Carson’s trademark. Whishaw’s young man first mentions Marilyn in her preproduction days on Clash by Night where MGM is helping to wage the battle of Troy — even though RKO released Fritz Lang’s 1952 classic. 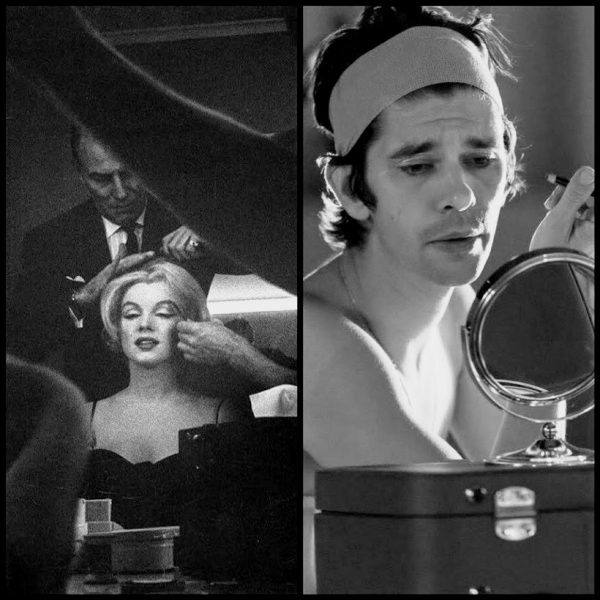 Whishaw often dictates that Marilyn ‘enter as Truman Capote’ before imitating that writer’s high-pitched voice. 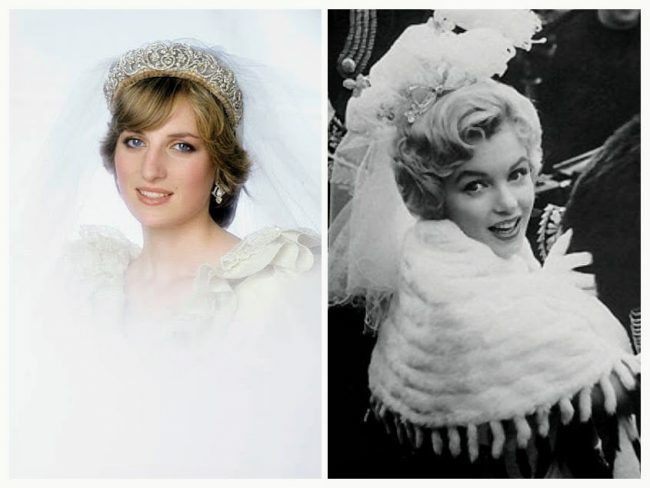 This Marilyn also has a young daughter, Hermione, which is also the name of Helen’s long-lost daughter. 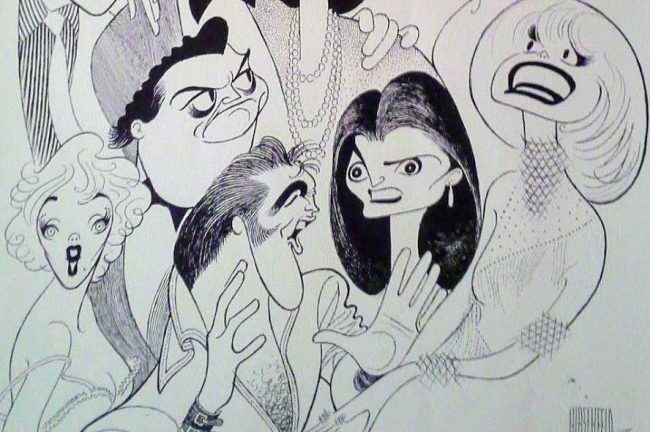 Marilyn’s Hermione lives in New York City, and occasionally Pearl Bailey makes an appearance there. In an interview with The Times, Ben Whishaw reveals more about his intriguing role in Norma Jeane Baker of Troy, which opens at New York’s hottest new arts venue, The Shed, on April 6 through May 19. Goodbye Norma Jeane, the new play about ‘dance director’ Jack Cole and the movie goddesses he coached – set in the aftermath of Marilyn Monroe’s death in 1962 – has opened at the Above The Stag studio theatre in Vauxhall, South London, and will be playing there until April 7. Goodbye Norma Jeane, a new play opening in the Studio Theatre at Above the Stag in Vauxhall, South London tomorrow, is seemingly not about Marilyn per se (despite the title – well, at least her name’s spelt correctly), but a tribute to her favourite choreographer, Jack Cole – starring Tim English, with Rachel Stanley playing Monroe and other screen goddesses. “Jack Cole taught Hollywood to dance. In the new play, Miss Caswell is played by Jessie Mei Li. As you can see below, she looks lovely in the role, but wisely avoids doing a Monroe impersonation. Tickets are selling out fast, but in association with the National Theatre and Fox Stage Productions, a live performance will be broadcast at selected cinemas across the UK and USA from April 11 onwards – pick your nearest venue here. 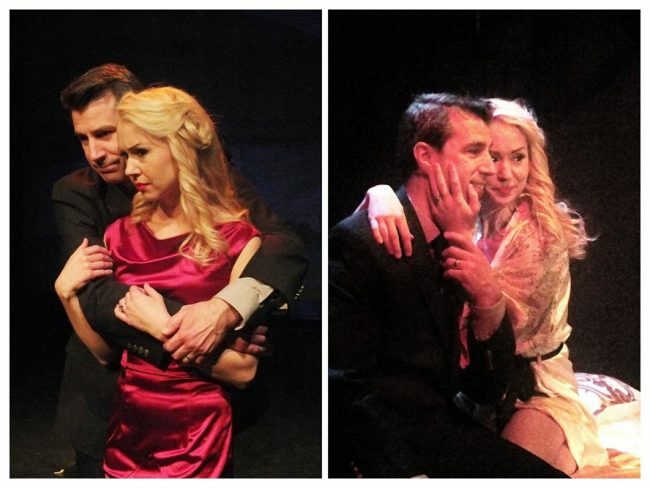 If you’re in Tucson and looking for a St. Valentine’s Day treat, With Love, Marilyn – the touring one-woman show starring actress and singer Erin Sullivan – is playing at the Temple of Music and Art through to Sunday, February 17. Born in Seattle in 1921, Carol and her parents moved to San Francisco when she was two weeks old. Her mother Adelaide was of German Jewish descent and her father George was part African-American (on his mother’s side.) A newspaper editor by profession, George was also a Christian Science practitioner and teacher. 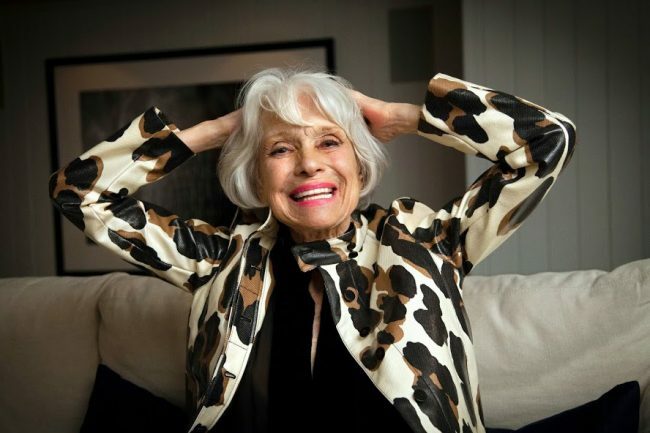 At sixteen, Carol left home to major in drama in Bennington College in Vermont. 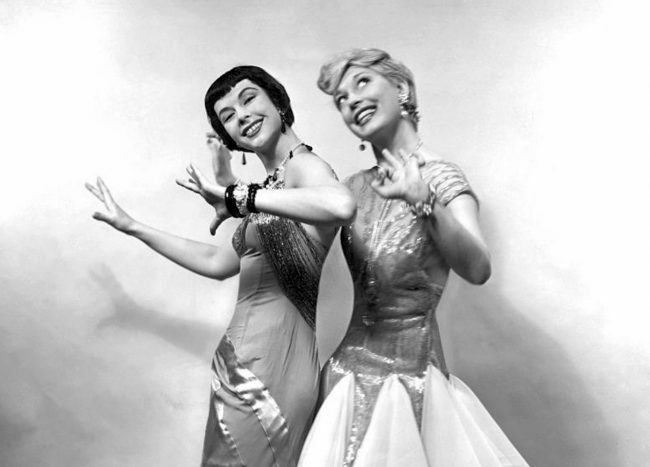 In 1941, she won her first Broadway part as Eve Arden’s understudy in a revue, Let’s Face It! That year she was married for the first time, to writer Theodore Naidish. They divorced after five years. 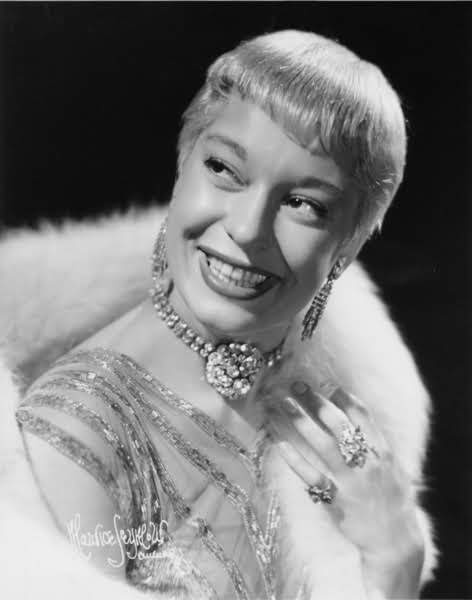 In 1948, Carol won a Theatre World Award for her featured role in another revue, Lend An Ear. 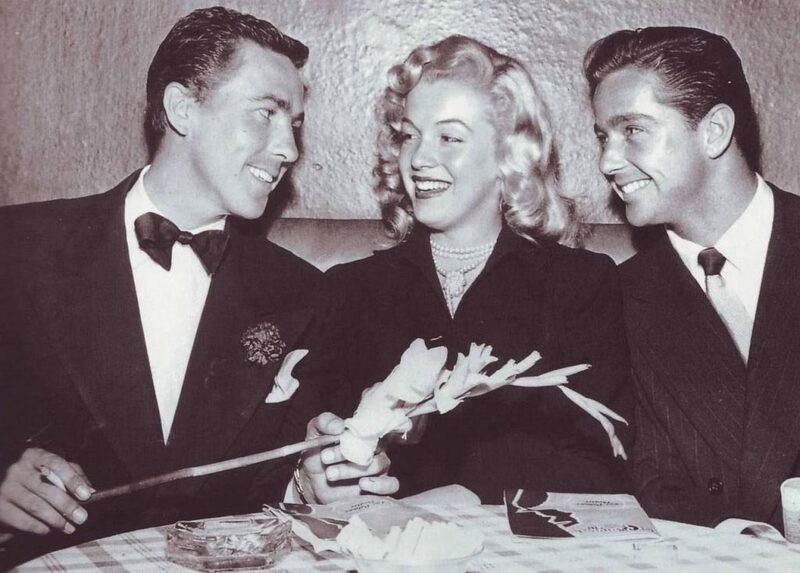 Stacy Eubank noted in Holding A Good Thought For Marilyn: The Hollywood Years, that on June 16, a little-known starlet, 22 year-old Marilyn Monroe, attended the opening night at the Las Palmas Theatre in Hollywood, where she was photographed with director Bill Eythe and actor Bill Callahan. Illustrator Al Hirschfeld published a caricature of Carol as a flapper in the show, the first of many portraits to come. She even credited his artwork with helping her win the part of Lorelei Lee in Gentlemen Prefer Blondes. 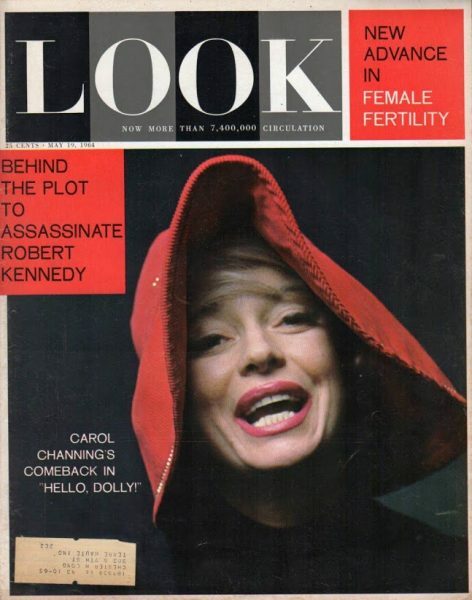 In January 1950, Carol made the cover of Time magazine. She was married again that year, to footballer Axe Carson, and they had a son, Channing Carson. After her third marriage to manager and publicist Charles Lowe in 1956, he was renamed Chan Lowe and went on to become a successful cartoonist. 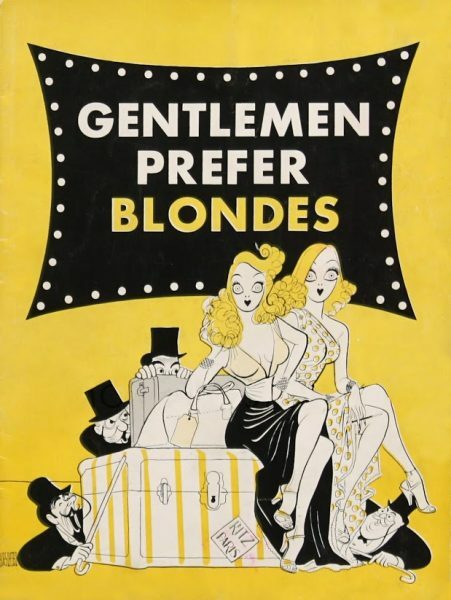 Darryl F. Zanuck swiftly acquired the film rights to Gentlemen Prefer Blondes for Twentieth Century Fox. Carol was duly invited to Los Angeles for a screen test, but it was generally assumed that Betty Grable, the studio’s reigning blonde star of musical comedy, would get the part. 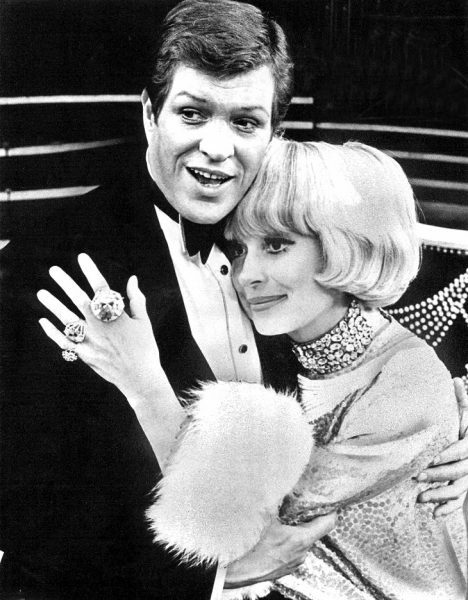 In any case, Carol had already decided to take the show to London after the Broadway run ended. 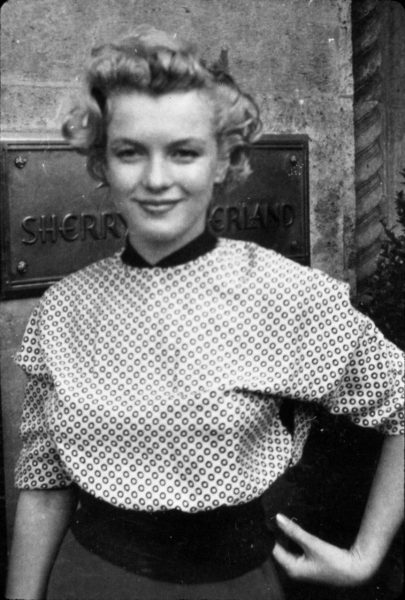 That November, after Blondes finally closed, the New York Post‘s Earl Wilson reported that Marilyn hoped to play Lorelei on the screen. In his 1992 biography of Monroe, Donald Spoto wrote that Fox informed Marilyn the part was hers on June 1, 1952 (her 26th birthday.) 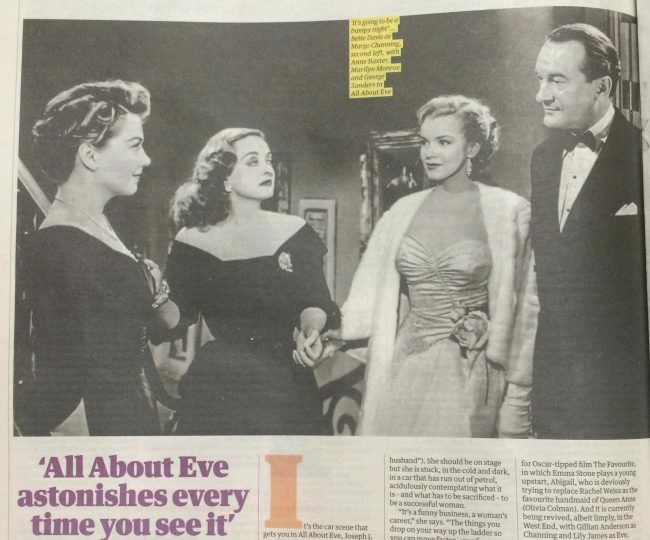 Nonetheless, the studio kept up the intrigue for several weeks before announcing it to the press, still claiming that Grable would star, with Marilyn turning brunette to play Lorelei’s friend Dorothy. 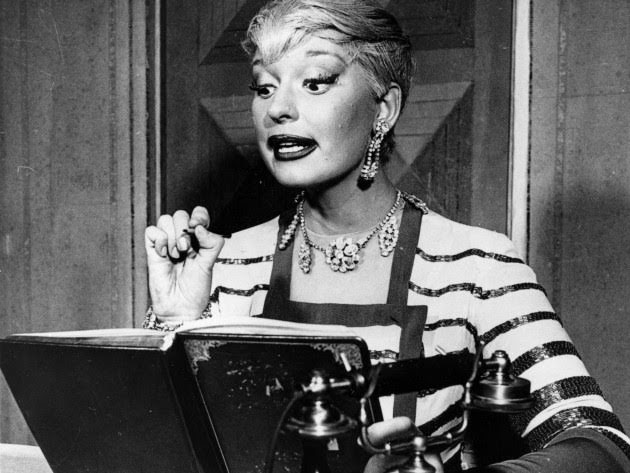 When the news broke on June 23, Hedda Hopper wrote that Carol had responded with a 200-word telegram to Fox, while Grable denied asking Zanuck for the part. Marilyn was now the studio’s rising star, but as Stacy Eubank observes, she was still on a standard contract and would cost Fox far less than either Grable or Channing. 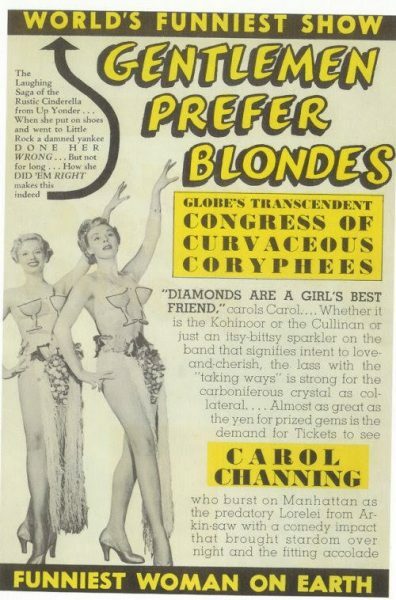 Gentlemen Prefer Blondes was a golden opportunity for Marilyn, and a huge success when it opened in 1953. 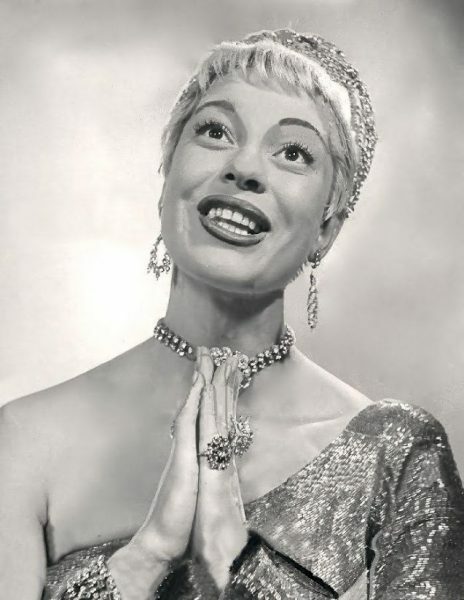 “I was heartsick over the whole thing, of course,” Carol admitted, and she also felt that Jack Cole’s flamboyant choreography “completely upstaged” the lyrics. “You can cast Lorelei two ways,” Loos explained. “With the cutest, prettiest, littlest girl in town, or with a comedienne’s comment on the cutest, prettiest, littlest girl in town. 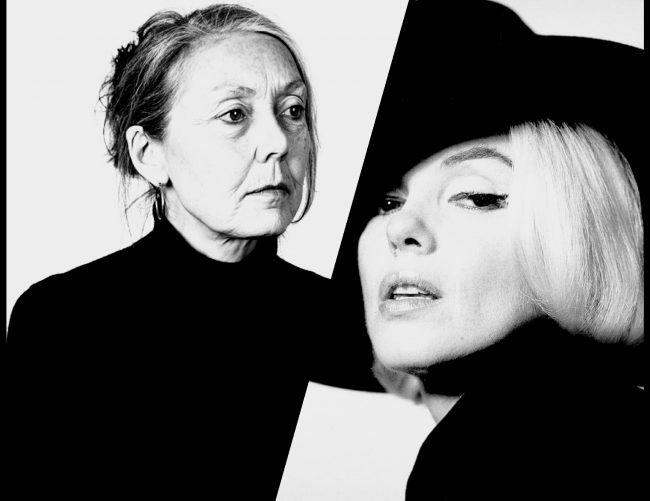 I wrote her as a comedy, and Broadway is attuned to satire.” Carol’s broader interpretation was perfect for the stage, whereas Marilyn brought a softer, more innocent quality to Lorelei. Her next great role was in Hello, Dolly! (1964.) She befriended Broadway newcomer Barbara Streisand, only to lose out again when the younger actress was cast in the film adaptation. A registered Democrat, Carol campaigned for Lyndon B. Johnson and was a favourite of his wife, Lady Bird. In 1966, she won the Sarah Siddons Award, and finally achieved movie stardom alongside Julie Andrews in Thoroughly Modern Millie (1967), winning a Golden Globe as Best Supporting Actress, and an Oscar nomination. In 1970, Carol became the first celebrity to perform at a Super Bowl halftime. Three years later, she was revealed to have been on disgraced president Richard Nixon’s Master List of Political Opponents – which she quipped was the highest accolade of her career. In 1998, Carol separated from her husband of forty years, Charles Lowe. He passed away shortly afterwards. She would marry once more in 2003, after rekindling her romance with high-school sweetheart Harry Kullijian. He died in 2011. Carol maintained her faith in Christian Science, followed a strict organic diet and swore off alcohol. A much-loved resident of Rancho Mirage, California, Carol had a star dedicated to her on the Palm Springs Walk of Stars in 2010. She returned two years later to honour Marilyn Monroe, praising her “brilliant and unique” performance in Gentlemen Prefer Blondes. Carol also attended a farewell party for Seward Johnson’s giant sculpture, ‘Forever Marilyn‘, when it left Palm Springs for the East Coast in 2014.